The SG-1 tone generator was developed so technicians could have a working tool which would be more useful than existing units. Pink noise is great for tuning theatres, but a tone is better for signal tracing and troubleshooting, and the search for speaker problems and house rattles calls for a continuously variable tone generator. Pink noise works best when the digital random generator (which creates the basic white noise signal) has a cycle long enough that you don't get a repeating pattern, or "gallop", in the low end. Add to this some reverberation measuring systems that require "red" noise, and you have the basic rquirements that inspired the creation of the SG-1. The SG-1 is a plug-in circuit card directly interchangeable with Dolby Laboratories' Cat. No. 85 series. From the initial digitally generated white noise, pink noise is produced by a 7-pole filter; red noise is produced with a single pole filter. The adjustable output level meets Dolby's level criteria, and we've included the level-switching circuit necessary for use in the CP-200. While the sine-wave oscillator is not meant for high-end testing, such as measuring distortion, it works well for finding rattles and resonances. The knob on the front panel can sweep the oscillator continuously from 25 Hz to 10 kHz. 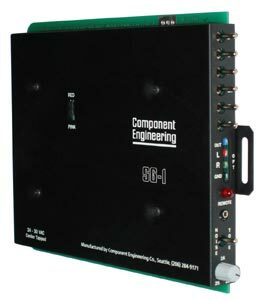 All channels can be switched independently either in phase or out of phase, and a jack is provided so the output can be keyed externally for RT-60 or other measurements. (This jack must be used when in red noise mode.) Output test jacks and external power input jacks are also included.